I've always loved writing. My Mother has impeccable penmanship...something I fear our future generations may lose what with the tech world we live in. I love calligraphy. Love. I haven't taken a class, but I've been wanting to for some time. For my birthday - I decided to take the class coming up by Anchorport Calligraphy - at Shindig Paperie in Fayetteville. SO excited! Its March 3 and it just can't come soon enough. 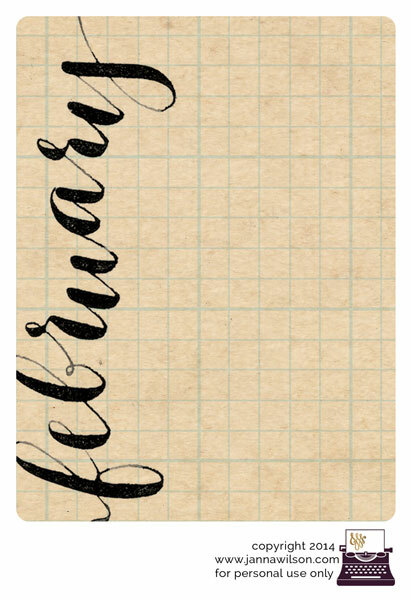 I've been warming up --and in the process I created a freebie to share...a hand-lettered journaling card for February! You can use the card to record daily memories, funny things the kids say or for your Project Life album. Download the file here. If you like it, you can purchase full the set soon! So check back!